The vicar was thrilled to hear that a new family was joining St. Hilary's. 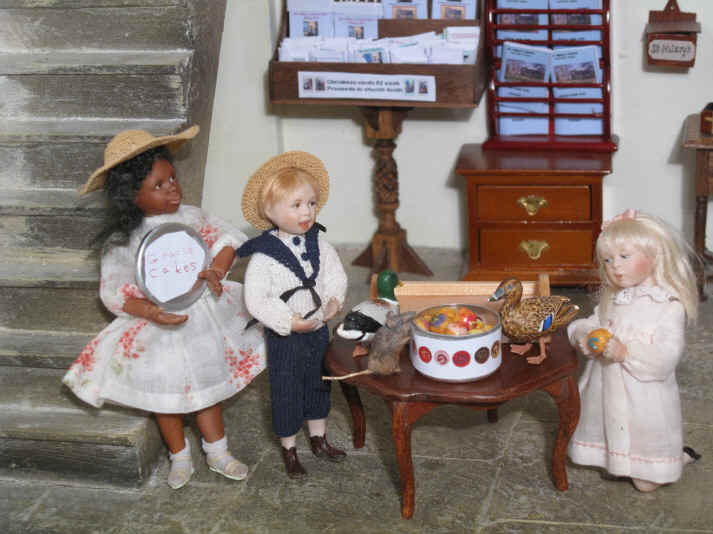 The children who visited the Miniatura Show were full of the news that they had met this great girl called Grace who told them she was coming to Daffodil Green in the New Year! Gracie and her mother did decide to visit Daffodil Green a couple of times though so that Grace could meet her new school and church friends. 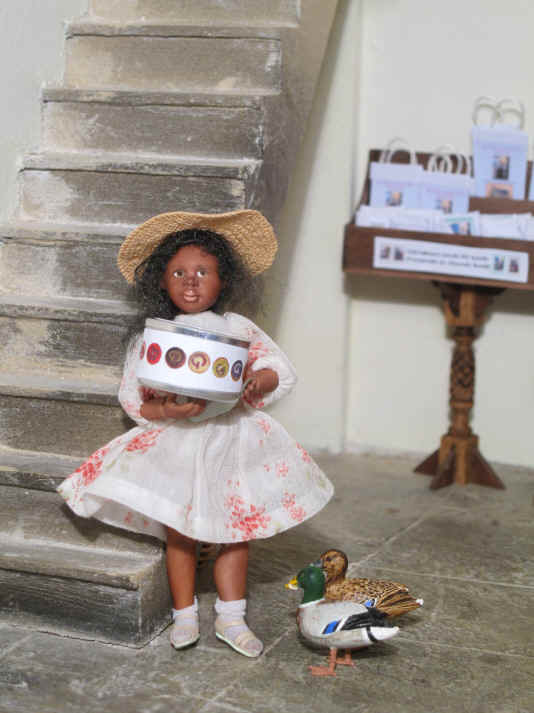 Grace has just wandered into St. Hilary's for the very first time when visiting Daffodil Green. She was thrilled when she turned around to see that this beautiful yellow labrador had followed her in. She wandered WHOSE dog he was? 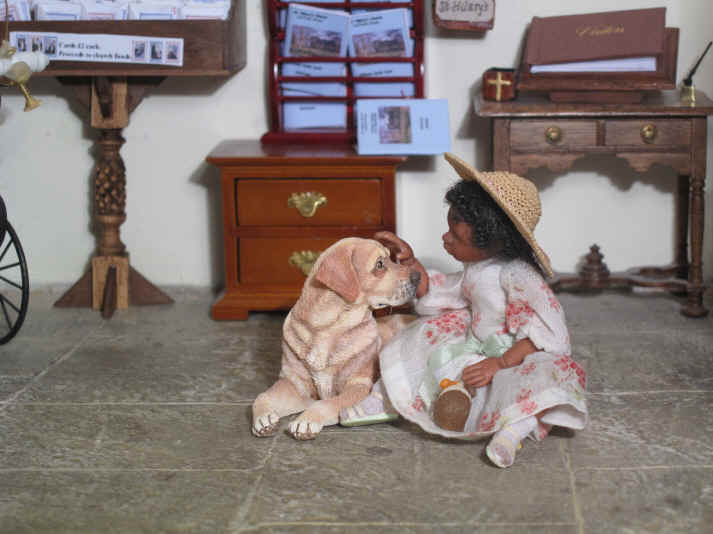 Adele is the first to greet Grace after the yellow labrador wandered OUT of church again. Adele is fascinated with Gracie's pet guinea pig, GP and asks her WHY is he called that? Can you guess? It is short for....."GUINEA PIG" ......well of course! 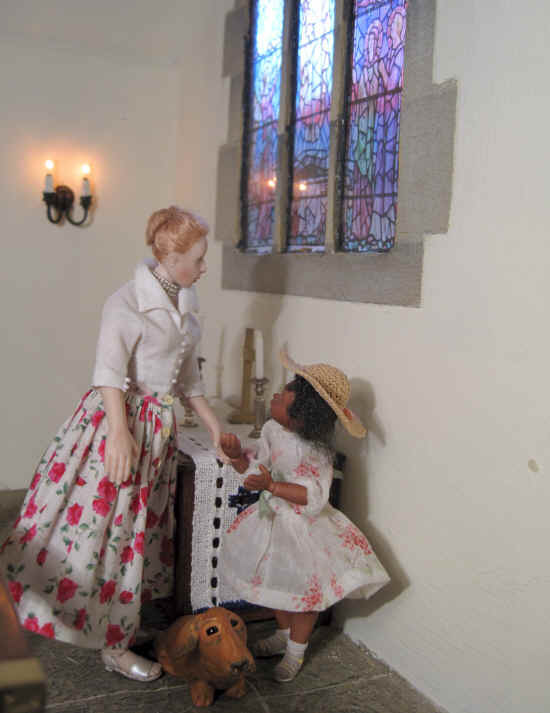 The vicar and church leaders were keen that Grace was made to feel really welcome when she actually moved in to Daffodil Green with her mother. They have therefore decided to have some social get-togethers for the children and this includes some games afternoons. 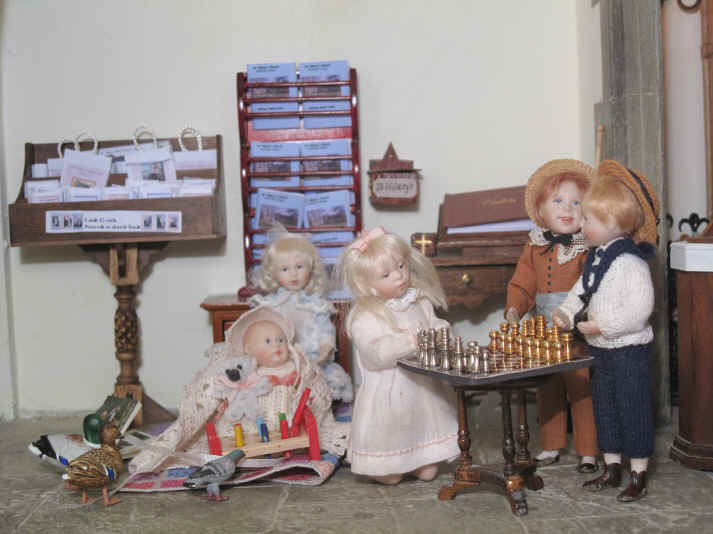 Here you can see Priscilla Jane, Tom and Ben playing chess........or trying to......so that when Grace arrives they can teach her too. Emily prefers to baby sit Clarissa instead as she thinks chess is far too difficult for her! Emily prefers to play snakes and ladders instead and she has got the help of Esme and Ernest too whilst Adele is helping Phoebe! Who have we here who has wandered into church again?............it is that beautiful yellow labrador! Ernest's father, Eric, is also visiting his son and daughter in law too. 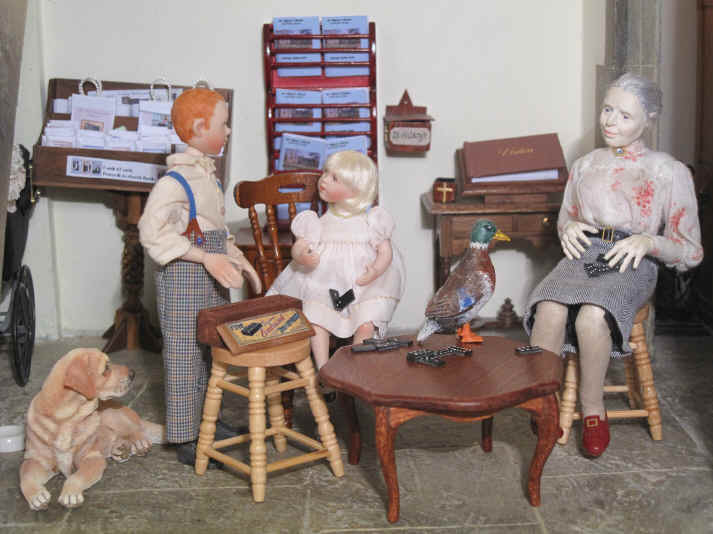 Miss Enid is enjoying a game of dominoes with Phoebe whilst Eric enjoys watching on. The yellow labrador is actually called Prince. He was training as a guide dog but didn't pass the last test on his last day poor boy. Fortunately Rev Ken and his family have take him in as their new pet.....isn't he lucky?! Gracie is used to playing cards on her own when her mother is busy. 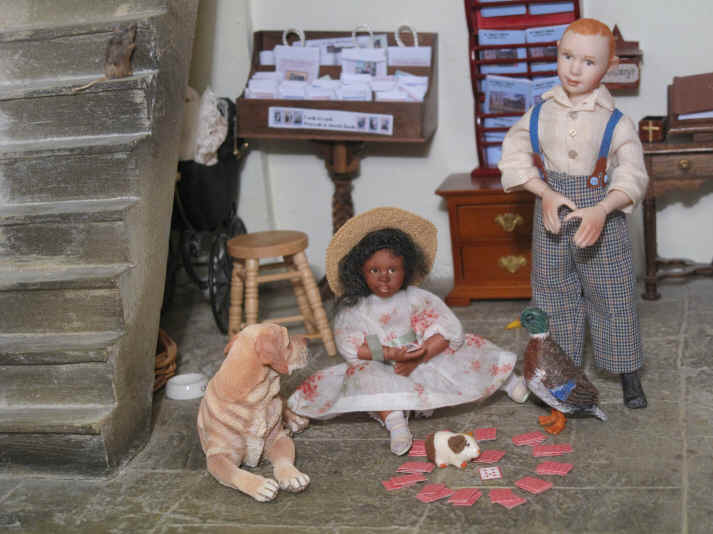 She brought a pack of cards with her to play Patience whilst the other children were busy elsewhere in the church. Prince loves to watch and GP enjoys being literally the centre of attention as he wants to be PART of Gracie's game of Patience. What HAS Gracie brought with her today? It is her very own tin with her very own recipe GRACIE CAKES! She thought they would be brilliant to have with the fruit juice, tea and coffee during the break. She is VERY proud of her own secret recipe "Gracie Cakes" and thought it would be a great idea to bake some especially to bring along to this week's games' afternoon. Doesn't the tin look SO pretty? Can you see that she has pictures of her cakes and they each have the letter "G" on for...........................well "Gracie" of course! Gracie shows her cakes off to Tom and Priscilla Jane! However Priscilla tells Gracie that they look like iced buns! Gracie is MOST indignant and tells Priscilla Jane that they are "NOT iced buns......they are GRACIE CAKES" because that is what it says on the tin! Gracie's cousin has helped her make the labels for her tin on his computer whilst she wrote "Gracie Cakes" for the label that went on the top of the lid. Sepp looks TOO interested in these "Gracie cakes" for Gracie's liking and she is keeping a weather eye on her. 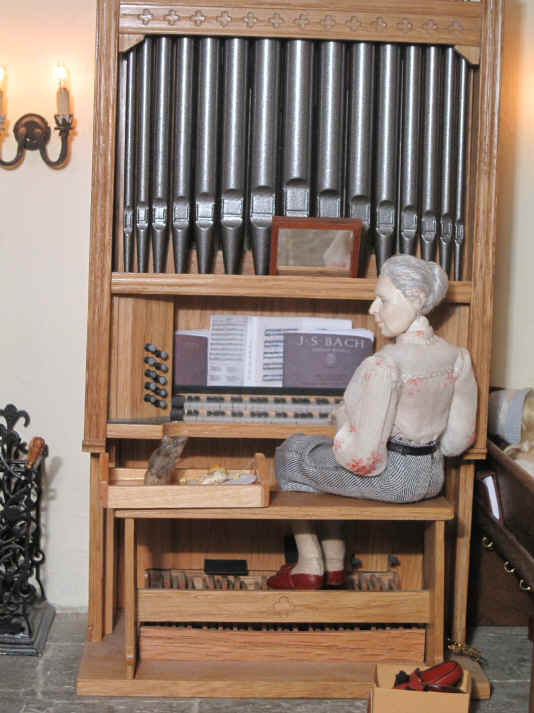 Oh dear...........Esther finds Gracie in the sanctuary ALL on her own and can see she looks quite upset. She asks her what is wrong and Gracie spills it all out. She can't understand WHY the other children call her "Gracie Cakes" "iced buns" and feels quite sad and lonely as a result. It is VERY hard to move home and this has made it much harder for her. 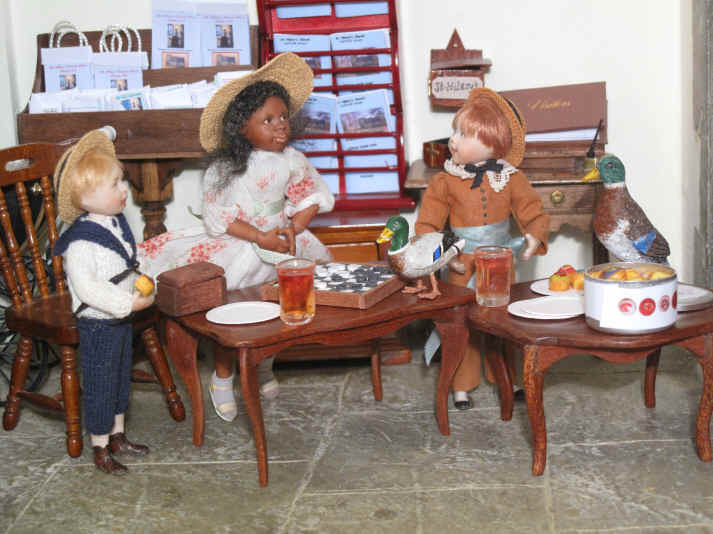 Esther goes back to the other children and explains how Gracie feels and tells them that she has come from all her old friends and is feeling quite lonely and sad and needs their love and support to help her settle in. They immediately feel quite guilty because it was just a joke to them and they didn't realise how bad it had made poor Gracie feel. Tom and Ben are telling Gracie how sorry they and Priscilla Jane are for calling her cakes "iced buns". They have now tasted them and think that they taste so much BETTER than iced buns. They really ARE "Gracie Cakes" because only she could make them! Gracie feels SO much better and now part of the Sunday School! 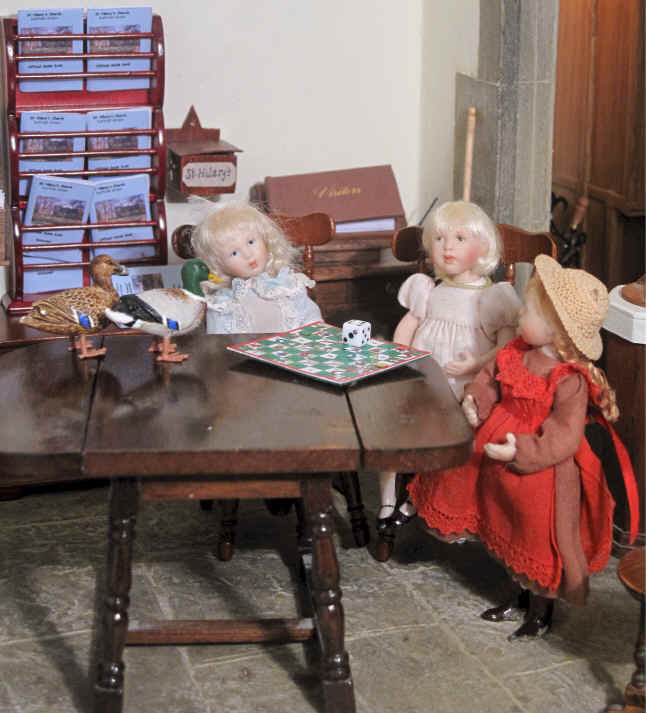 She is now asking if SHE can play draughts next after watching Tom and Ben play their game! Oh dear what has happened here? 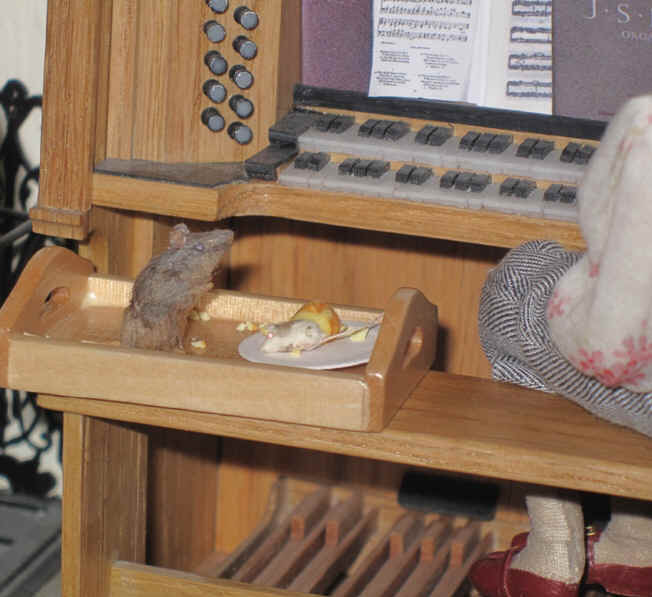 Ambrose has put a cake out for Miss Enid on a tray......but WHO has come along and eaten half of her cake and left loads of crumbs...............it is none other than Sepp, Homer's pet rat and Snowy, the friend of Nunc Dimittis.............they are both SO naughty. Many thanks to my sister Catherine of Dollshouse Heaven for my "Gracie Cakes"!